The month of October was kind enough to give us five Thursdays – a good excuse for a social night. 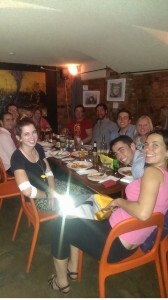 A Blood Drive had been on the cards for a few months and this was a great opportunity for those happy to donate to get together as a group before we met for dinner. Truth be told from 6 willing donors, only 3 were able to successfully complete a donation. The remainder were unable to donate due to a number of reasons – those questionnaires are getting stricter year on year but hey, our hearts were in the right place. After donations were completed we continued to Verve Restaurant where the remainder of the group joined us for a fantastic dinner of Pizzas, Pastas and other assorted Italian fare. While a few of us were keen to kick on afterwards, it was a school night so we called it with a busy Rotaract weekend ahead with Logan Rotract’s Smart Pups Dinner, Operation Christmas Child and our Dinner with a Difference in the days following. Looking forward to our District Christmas Party Camping Weekend in a few weeks’ time.